Within this whitepaper, we will guide you through unclaimed property reporting and escheatment by breaking down this often complex process into three core functions. After reading, you will be able to identify the factors that can help your organization report efficiently and effectively to achieve compliance.  Understand your obligations as a holder of unclaimed property and get your “house in order” when it comes to identifying reportable property and calculating dormancy. Learn best practices, and how to go above and beyond to ensure that your due diligence program is successful in retaining accounts and reuniting the rightful owners with their funds. Take charge and efficiently develop the correct unclaimed property reporting deliverables to ensure your organization is in full compliance with state requirements. The Principles of Escheatment & Guide to Compliance".